Inflation can be understood as the destruction of a currency’s purchasing power. To combat this, investors, central banks and families have historically stored a portion of their wealth in gold. I call this the Fear Trade. The Fear Trade continues to be a rational strategy. Since President-elect Donald Trump’s surprise win a month ago, the Turkish lira has plunged against the strengthening U.S. dollar, prompting President Recep Erdogan to urge businesses, citizens and institutions to convert all foreign exchange into either the lira or gold. Most obliged out of patriotism, including the Borsa Istanbul, Turkey’s stock exchange, and the move has helped support the currency from falling further. Venezuela, meanwhile, has dire inflationary problems of its own. Out-of-control socialism has led to an extreme case of “demand-pull inflation,” economists’ term for when demand far outpaces supply. Indeed, the South American country’s food and medicine crisis has only worsened since Hugo Chavez’s autocratic regime and the collapse in oil prices. The bolivar is now so worthless; many shopkeepers don’t even bother counting it, as Bloomberg reports. Instead, they literally weigh bricks of bolivar notes on scales. “I feel like Pablo Escobar,” one Venezuelan bakery owner joked, referring to the notorious Colombian drug lord, as he surveyed his trash bags brimming with worthless paper money. Because hyperinflation has destroyed the bolivar, the ailing South American country sold as much as 25 percent of its gold reserves in the first half of 2016 just to make its debt payments. Venezuela’s official holdings now stand at a record low of $7.5 billion. The U.S. is not likely to experience out-of-control hyperinflation anytime soon, as the dollar continues to surge on bets that Trump’s proposals of lower taxes, streamlined regulations and infrastructure spending will boost economic growth. But I do believe the market is underestimating inflationary pressures here in the U.S. starting next year. 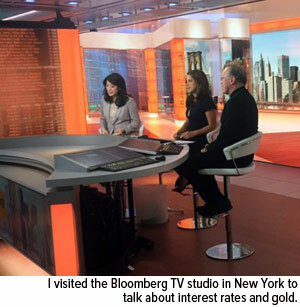 As I explained to Scarlet Fu and Julie Hyman on Bloomberg TV last week, inflation we might soon see is largely caused by rising production costs, which is different from the situation in Turkey and Venezuela. Nevertheless, it still serves as a positive gold catalyst for 2017. 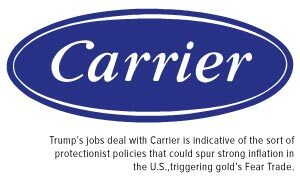 Consider Trump’s recent Carrier deal—the one that saved, by his own estimate, 1,100 jobs from being shipped to Mexico. We should applaud Trump and Vice President-elect Mike Pence for looking out for American workers, but it’s important to acknowledge the effect such interventionist efforts will have on consumer prices. As I see it, the Carrier deal is indicative of the sort of trade protectionism that could spur inflation to levels unseen in more than 30 years. The Indiana-based air conditioner manufacturer has already announced it will likely need to raise prices as much as 5 percent to offset what it would have saved by moving south of the border. We can expect the same price inflation for all consumer goods, from iPhones to Nikes, if production is brought back home. That’s just the reality of it. Prices will go up, especially if Trump succeeds at levying a 35 percent tariff on American goods that are built overseas but imported back into the U.S. The extra cost will simply be passed on to consumers. What’s more, Trump has been very critical of free trade agreements, threatening to tear them up after blaming them—NAFTA, specifically—for the loss of American jobs and stagnant wage growth. There’s some truth to this. 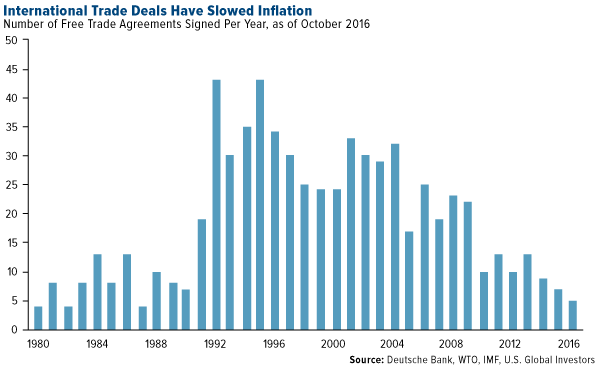 But trade agreements have also helped restrain inflation over the past three decades. This is what has allowed prices for flat-screen, plasma TVs to come down so dramatically and become affordable for most Americans. Additional tariffs and the inability to import cheaper goods are inflationary pressures that could result in a deeper negative real rate environment. 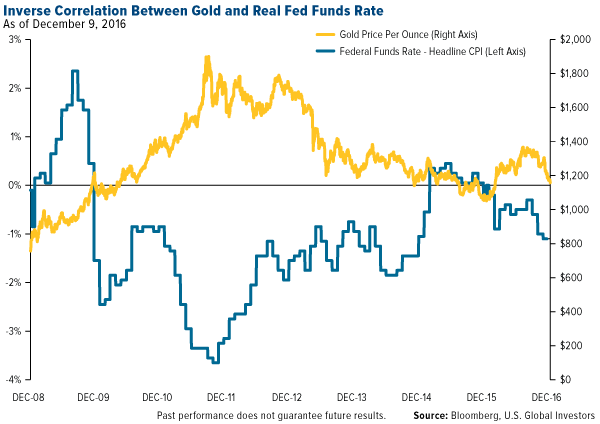 And as I’ve pointed out many times before, negative real rates have a real positive effect on gold, as the two are inversely correlated. Macquarie research shows that last year, ahead of the December rate hike, gold retreated about 18 percent from its year-to-date high. Afterward, it gained 26 percent in the first half of 2016. The decline so far this year has been about 15 percent from its year-to-date high. Gold, according to Macquarie, is setting up for another rally in a fashion similar to last year. The U.S. government is currently saddled with $19.9 trillion in public debt. Since 2008, federal debt growth has exceeded gross domestic product (GDP) growth. And according to a Credit Suisse report last week, Trump’s tax proposal, coupled with deficit spending, could cause federal debt to grow even faster than under current policy. The U.S. dollar accounts for about 64 percent of central banks’ foreign exchange reserves. 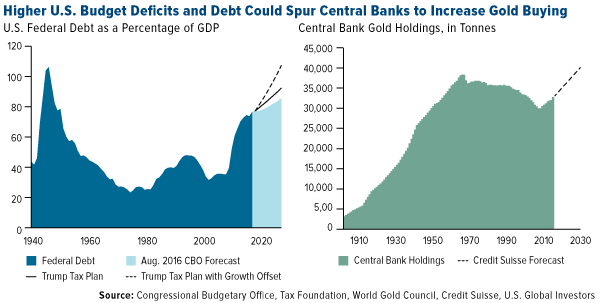 With the potential for higher U.S. budget deficits and debt risking dollar strength, central banks around the globecould be motivated to increase their gold holdings, says Credit Suisse. As I mentioned last week, gold is looking oversold in the short term and long term, down more than two standard deviations over the last 20 trading days. Statistically, when gold has done this, a return to the mean has often followed. 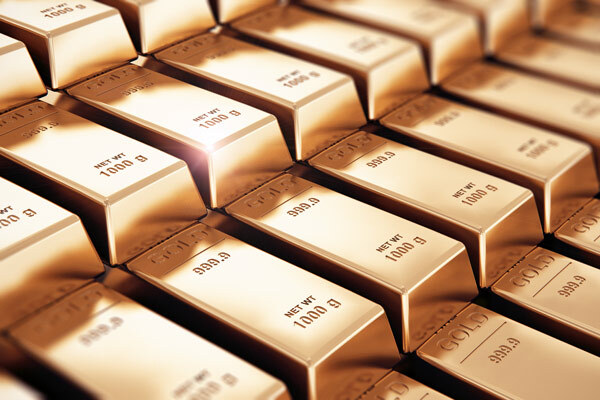 This has been an attractive entry point for investors seeking the sort of diversification benefits gold and gold stocks have offered. As always, I recommend a 10 percent weighting: 5 percent in gold bullion, 5 percent in gold stocks, then rebalance every year. Previous Article Gold and robust silver starting to bounce? Will Shanghai pull gold price through $1,200?